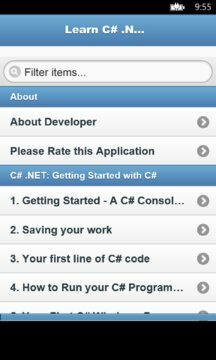 This app provides you all basic and advanced details about every concept used in C# (C sharp). All data is divided within list and easy to understand. You don't require a running internet connection for the functioning of the app. 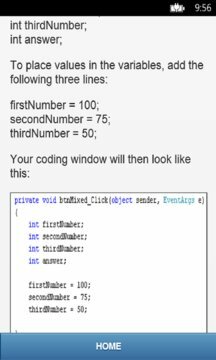 This is a Free app on C# Programming. C# is a multi-purpose computer programming language suitable for a wide variety of development needs. This app introduces C# language fundamentals and covers a variety of the base class libraries (BCL) provided by the Microsoft .NET Framework. Although C# is derived from the C programming language, it has features such as garbage collection that allow beginners to become proficient in C# more quickly than in C or C++. Similar to Java, it is object-oriented, comes with an extensive class library, and supports exception handling, multiple types of polymorphism, and separation of interfaces from implementations.